The Archive and Heritage Committee was formed in 2015 to gather, maintain and promote the historical records which relate to the church, its members and life. A historical Library was established in St Andrew’s House and a database commenced of archival holdings. 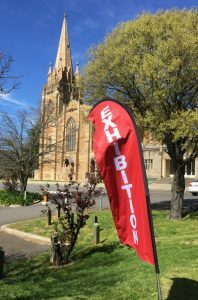 Further to the Historical Heritage listing of the church of St Andrew, St Andrew’s House and Beadle’s cottage; the vision became the “Open Church, Open House” program, opening the church and buildings to the Canberra community regularly with trained Guides. This has been achieved through a Heritage Grant gained to develop an Exhibition –“Living Stones” in St Andrew’s House which highlights both the History of the Presbyterian church in Canberra and the lives of many members who have contributed to the building and development of Canberra. All are welcome to visit the Exhibition in conjunction with a conducted tour of the Church on the first Wednesday in each month, from 6 February 2019, commencing at 11:00am which features, the organ, the choir, voices from the windows, features of the Memorial chapel and optional bell ringing. The Archives and Heritage Team restarted tours of the Church and the “Living Stones” Exhibition from Wednesday 6 February 2019.